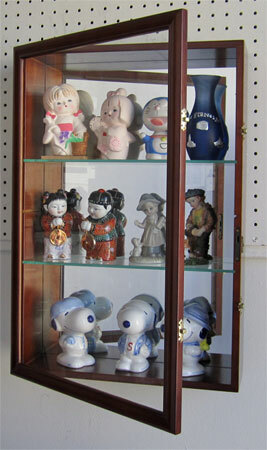 Item shown above : Walnut Finish with a glossy protective coat (miniatures and figurines sold separately). This solid wood wall mountable cabinet would add a great touch to your living room. Two removable Glass Shelves which allows you to move them according to your need. There is an empty slot in the middle of the display case where you can relocation the shelf. Glass mirror background makes the display objects stand out. Brass hinges and door latches for elegant appearance. Wall brackets on the back for hanging (wall mounted). You may also sit it on the top of a table or counter. Hinged Glass door cover prevents dust and and protects. Built-in Lock.No assembly required. Interior: 22"H X 14.5"W X 4.1"D Distance between rows: top 7.25", middle 6.75", bottom 7.25"